Coles first location in Shepparton was in Fryers St.
An interview with 96 year old Dot Clark who worked for 15 years at the Wyndham St Coles Cafeteria. George Coles, (son of a commercial traveller in London) the grandfather of the Coles Brothers, arrived in Australia in 1854. He married Miss Sarah Hane Clipsham at St Paul's Church in Melbourne (now St. Paul's Cathedral). He and his family went to the goldfields at Jim Crow (which is now Daylesford). George Coles made his living as an engineer working on the gold crushing machines. In 1858, the first of their six children were born. He was named George Coles and was to become the father of the Coles Brothers. It is not known how long they remained in Daylesford, but at some time, they moved to the St Arnaud district, and George Coles worked as a butcher at Stuart Mill. 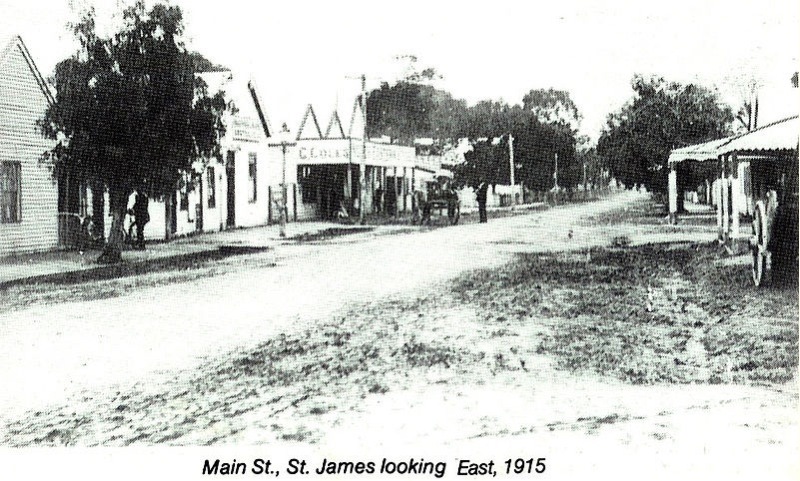 In 1892, George Coles bought the North Eastern Stores at St. James, in Northern Victoria, with a branch four miles away at Lake Rowan. Although the population was only 150, the business was successful and netted 1,000 pounds profit in the first year. The North Eastern Store sold everything from farming to household stores. In 1893, the family moved from Geelong to Lake Rowan and later, George Coles built a large, 10 room house at St. James. He attended the Presbyterian Church and sent all his children to Sunday School. George's younger brothers Fred and Jim managed two other branch stores he owned at Diapur and Nhill. Tragedy struck in 1900 when Mrs Elizabeth Coles died suddenly and left George with 10 young children to look after. 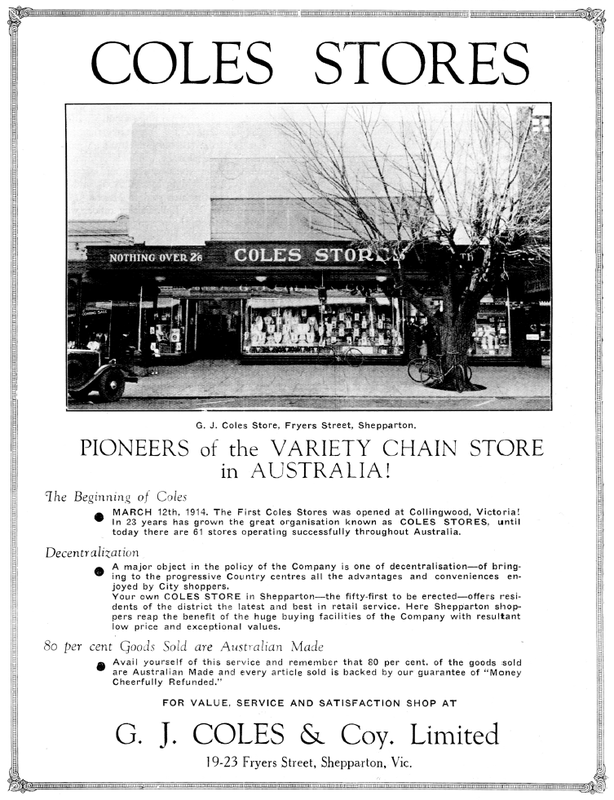 1902 was a drought year, and George Coles sold the Diapur and Nhill stores to his brothers. The young G.J. 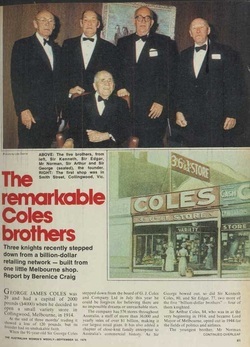 Coles helped his father at the St James store until the rather conservative business practices of his father prompted him to gain wider experience in Melbourne. He took a job in Crooks National Stores in Prahran, Melbourne, took up a bookkeeping course and read a US magazine called System. GJ Coles Store located half way down on left side. You can see the sign. 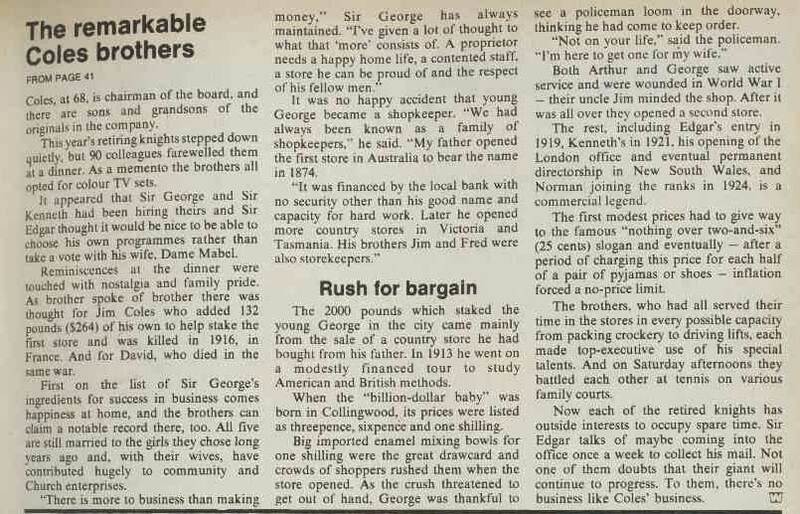 A year later, with his health failing, George Coles sold his St. James store to his eldest son for £4,500-0-0, on terms, to be paid at 6% over three years. Young George was only 24 at the time and only had £25-0-0/- at that time. He immediately made changes to to the business, having a sale and sending advertising to his 200 customers. He announced his policy of one price to everyone. Within 12 months, he had reduced the stock by £1000, and made 5% profit on sales. By 1912, his sales were £12,000 per annum and he continued to make his repayments to his father on time. In 1913, he had paid his father in full, and also made £2,000, which, at that time, was an achievement. He sold the store and took a trip around the world, and find out for himself the best kind of business to operate. It was a wonderful trip, and George was fascinated by the US 5 and 10 cent stores. He also studied the American firm Butlers, and used their store manual, The Butler Way. In January 1914, he arrived back in Melbourne, and with his brother Jim, plans were made to open the first 3d, 6d and 1/- stores in Australia. They successfully tendered for the insolvent business Jays in Smith St, Collingwood, and opened on the Thursday before Easter, April 11th, 1914. They distributed 10,000 dodgers around the suburbs, the principal attraction being, Nothing over 1 shilling. 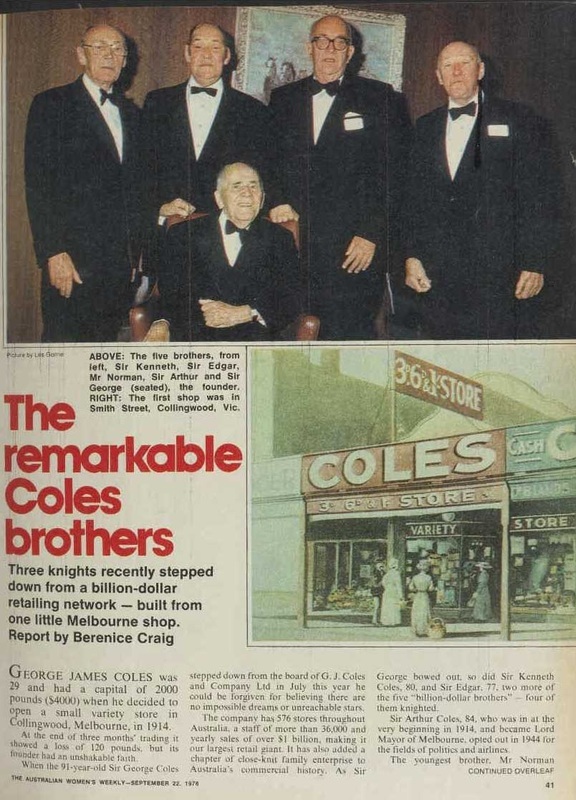 Thus began a business which revolutionised retailing in Australia.